On a Saturday afternoon in the heart of the Tenderloin neighborhood, a man sleeps in a fetal position against a mailbox just outside G & H Liquor on Jones and Turk. Inside the store, within 15 minutes there are four alcohol sales. One patron is turned away. “If you can’t walk then no, we don’t sell beer or liquor,” the store clerk said. For most, corner stores are an afterthought—a last resort just down the street for forgotten ingredients or late night purchases. But for residents of the Tenderloin, a majority of whom permanently live in single room occupancies (SROs) with communally shared bathrooms, kitchens, and virtually no common area, public spaces like corner stores become an important aspect of daily life. With public domain a de facto extension of personal homes, the manner in which corner store owners conduct business has a profound effect on the entire Mid-Market community. There is the family-oriented store that opts out of selling alcohol, has a fresh produce aisle, and keeps a caged pet chicken inside for the children in the neighborhood to play with. Then there are the businesses that allegedly host drug deals, sell single cigarettes for 50 cents, and have intoxicated patrons slumped outside the storefront. Whether they want the responsibility or not, store owners in the Tenderloin have a powerful influence on the community their businesses exist to serve. A lack of vigilance can be defined by selling alcohol to patrons who are already too inebriated to turning a blind eye to drug transactions occurring both in and around their store. The latter, however, may not always be a store owners decision. But for the owner who willingly shelters drug transactions, that “is something that we view differently,” Captain Ewins said. Government agencies have taken note, and have worked in recent years to close down the more lawless businesses. “My office worked closely with the police department and the mayor’s office to close at least two liquor stores,” District 6 Supervisor Jane Kim said. Big Boy Market at Golden Gate and Leavenworth and Tip Top Grocery Market on Turk and Taylor were “the two most problematic ones,” Kim said. Before the closure of Big Boy there were also Barah’s Market on Leavenworth and Turk and Razan Deli and Grocery on Ellis and Leavenworth. City Attorney Dennis Herrera filed a lawsuit in the San Francisco Superior Court against both store owners, claiming they allowed drug transactions to occur both inside and outside their stores. The suit stated that undercover officers were able to purchase heroin and cocaine inside Barah’s in full view of the store clerks. Razan Deli was ordered to close for one year beginning April 1, 2012 and pay an $80,000 fine to the city for protecting drug dealers and thieves. Barah’s Market was allowed to stay open as long as they close at midnight, hire a security guard, and install security cameras around the store. However, Barah’s Market is no longer in business and is now TL Market and Deli. While it is necessary to shut down troubled businesses, there may be a more long-term solution to improving the community than store closures, according to Kim. This aligns with the work of organizations like the Tenderloin Healthy Corner Store Coalition, which works with store owners to “reset” their businesses by offering a fresh produce aisle, cleaning up window displays and providing new shelves. “We’re trying to focus on how can we work with corner stores and turn them into institutions of positive interactions in the neighborhood,” Thayer said. He is one of the founding members of the coalition and has worked with four corner stores in the community since mid-2012. Radman’s Produce Market on Turk and Jones was the first of the four stores reset by the Tenderloin Healthy Corner Store Coalition. A large produce section near the entrance now boasts a variety of groceries including tomatoes, lettuce, onions, Persian cucumbers, ginger, peaches, avocados and bell peppers. There is also a caged pet chicken for children in the neighborhood to come and visit. In the beginning of the reset in spring of 2014, Radman’s took two orders of produce a week. Now, Radman’s takes up to five produce orders a week. 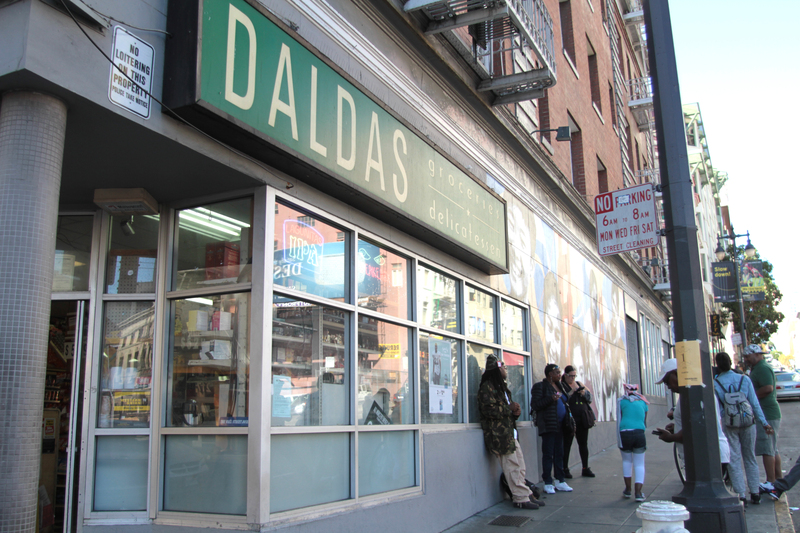 Daldas Grocery on Eddy and Taylor is another store that was reset by the Tenderloin Healthy Corner Store Coalition in May. While their produce section is not as extensive as Radman’s, owner Satwinder Multani made other changes to store operations to help the community. Store conversions may even be more effective than store closures. 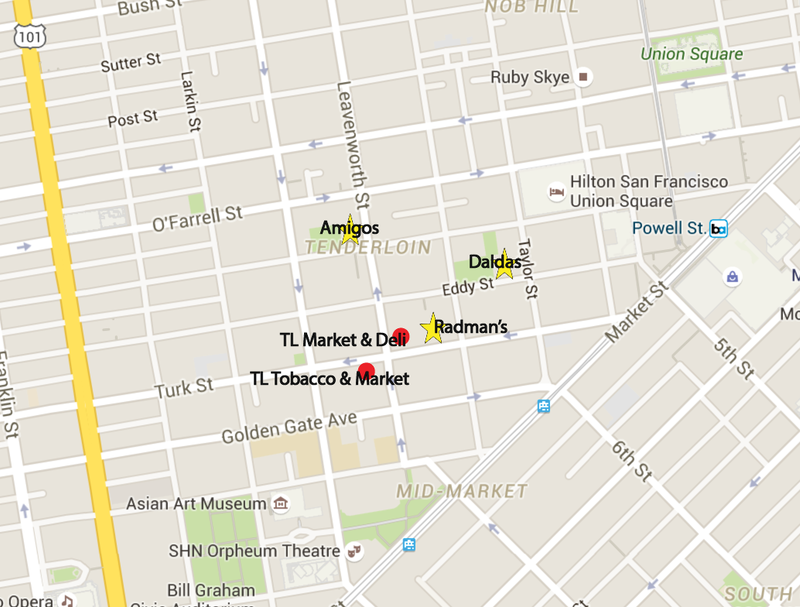 The storefronts of Radman’s, Daldas, Amigo’s Market on Ellis and Leavenworth and Mid-City Market on Geary and Larkin — the four reset by the Tenderloin Healthy Corner Store Coalition — have reduced loitering. In contrast, after the lawsuit against Barah’s Market, it shut down and was replaced by TL Market and Deli, which still faces persistent loitering. Two people are engaged in a game of dice. A woman with maroon-colored streaks on her face paces back and forth on the sidewalk. Money — in exchange for illicit goods — passes from hand to hand. Inside the store, there is an unplugged ice-cream fridge blocking the only aisle of the store. The display to the left of the cash register offers a pyramid of corn dogs. Across the street is TL Tobacco and Market, the location of a shooting in January of this year. Service groups have claimed suspicious activity happening with the store and have sent a “demand letter” to the owner. A demand letter was also sent to Big Boy Market before it was sued. Shutting stores down for criminal activity is proactive in one sense but unsustainable in another, as the crime will simply migrate to another storefront. Thayer believes that encouraging food justice and access to fresh produce could help address core issues in the neighborhood. Other measures Supervisor Kim hopes to enact include rebuilding and reactivating Bodega Park, bringing in youth programs and providing more affordable housing, all of which she said cannot take place without the help of Tenderloin residents. Correction: Tip Top Market never had an operational off-sale liquor license. The off-sale (Type 21) license belonged to Grand Liquors. And Grand Liquors was not allowed to renew it’s lease and relocated it’s business to Tip Top Market. Tip Top Market had to go before the Planning Commission to be granted a conditional use to use re-establish their use of their Type 21 liquor license under the North of Market Special Use District. It was the Planning Commission not Jane Kim’s office that would not grant the conditional use authorization.